Beginning July 1, 2016, the ocean shipping industry will implement a new requirement that shippers of each vessel-bound consignment provide a verified gross weight. This information must be provided as a prerequisite for the cargo to be loaded onto the vessel and is the responsibility of the shipper. 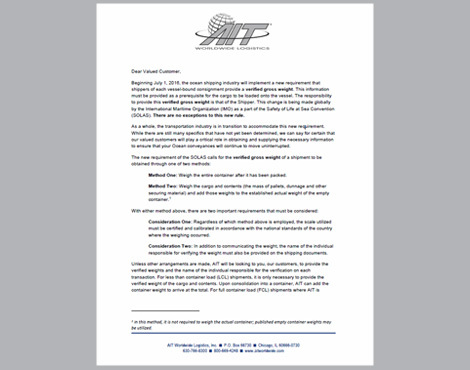 Accurate weight reporting can mean the difference between a safe voyage and disaster. The new SOLAS reporting requirements for verified gross weight are an important step towards making our industry safer. 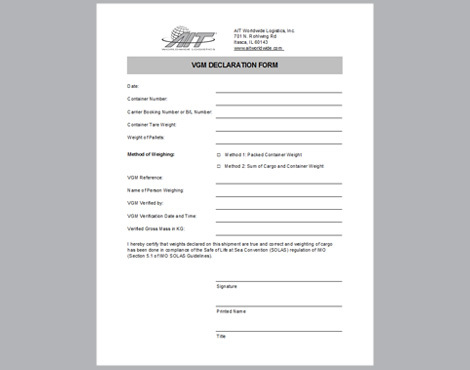 It is the shipper’s responsibility to accurately determine the verified gross weight (also referred to as verified gross mass) and provide that information to AIT. Full Container Load (FCL) shippers must provide AIT with the VGM of the container and all of it's contents. Less than Container Load (LCL) shippers must provide AIT with the weight of the cargo including the mass of pallets, dunnage, and other securing material. In an effort to facilitate a seamless transition, AIT is providing a VGM declaration form for download and an overview of the changes in a customer letter below.